We believe that volunteering should be FUN. It’s often hard work but it should always be rewarding and make you feel like you were useful. Thought about doing something more regularly? We have over 100 affiliated clubs across the county that could use your support! We can find a club locally to you and put you in touch with the club leader. Your support could involve lots of things from leading or playing games with the young people to helping to run the tuckshops. Just being there with a smile can make a difference!!!! Do you have Knowledge or skills in a specific field, maybe arts and craft or martial Arts, that you could share with the clubs. Working directly with young people isn’t the only option, there are various roles that are vitally important in maintaining a club such as fundraising, keeping accounts, recording minutes. 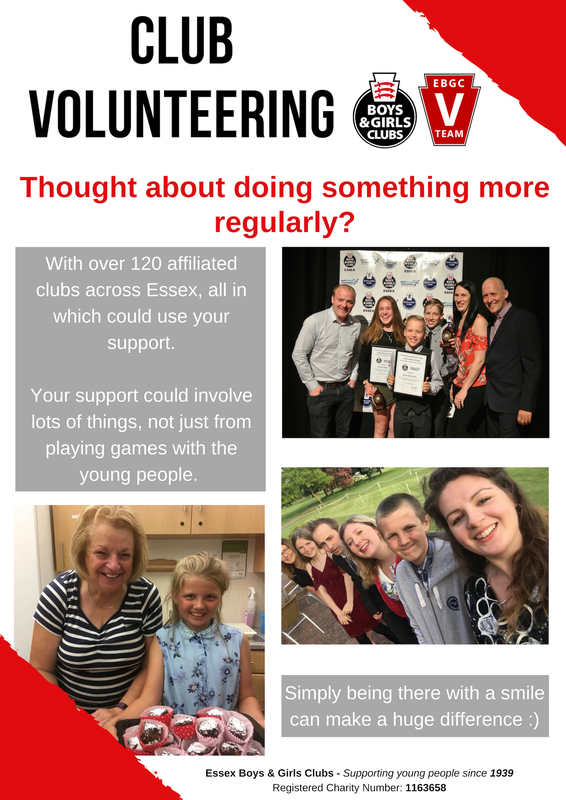 EBGC can help you to obtain a DBS and support you along the way with training needs if that’s from supporting your Young Volunteers to your Adult Volunteers. An old classic which can use your support. Based at one of our oldest clubs, Ingatestone Boys Own Club our Pool Championships will be an absolute blast. You maybe tasked with refereeing a game or being a photographer or even the time keeper for the event. Do not worry, if you do not know the rules we’ll help you along way. Into to Cricket? This could be the event for you. Help our staff pick talented young people from our affiliated clubs to be a part of our REP Cricket Squad. Ready steady bake…. If you’re a keen baker, then this event will be for you. This will be a great event to combine for volunteering and baking skills together. There could be a possibility to grab some free cake and help judge the amazing entries from our affiliated clubs. Come along and support our staff in delivering a cricket programme for our REP Squad and for our affiliated club members. Brilliant event to learn a few things with the help of our experienced coaches. * Specific qualification(s) may apply. Love a kick about, this event will be one for you. We are in need of volunteers to help support one of our sports events. You could start your refereeing debut. If you do not want to be in charge of the pitch, there are plenty of other roles to get stuck in with. Brilliant opportunity for fundraising however you do need to be 18+ to take part due to the physical demand of the activity. If you can drive a minibus/ have a D1 on your licence your help will be great appreciated driving our teams to their destinations across the country. Be a part of EBGC’s biggest event of the year, where youth clubs from the EBGC network come together to enjoy the privilege that comes with membership of EBGC – heavily subsidised access to Stubbers Adventure Centre with extra activities from the EBGC team! As a volunteer you are expected to help us create the special atmosphere of the weekend, acting as role models by ensuring everyone is having a great time, including yourselves! You will support delivery of Sport, Arts, Catering or Event Management, throughout the weekend. And at times, for a minimum of two activity sessions, you will have the opportunity to join the clubs on the Stubbers activities! 1, 2, 3, 4, 5 once I caught a fish alive. Come and join our annual fishing event… you can get involved and if you’re lucky catch a fish! If fishing isn’t your cup of tea why not support the young people by helping out with registration or even taking photos. We’ve just set up a new outdoor centre based at Layer Marney Tower in Colchester. We need a strong volunteer team to assist in the running of the day and also ensure safety of all the young people taking part. Young people are aged from school Year 5+.